The easiest way to see what Santa's up to is to visit NoradSanta.org where you can see an embedded map of Santa's journey. The North American Aerospace Defense Command says the man in red officially began his annual journey across the globe at 2 a.m. EST time Saturday morning. If you'd rather see Santa in all his glory on Google Earth, click the "Track Santa On Google Earth" button in the bottom right corner of the map. This will prompt you to download the Google Earth Plug-in for your browser (Windows 2000 or higher and Mac OS X 10.5 or higher). You can easily track Santa from any mobile device equipped with Google Maps, including Android smartphones and tablets, the iPhone, and the iPad. 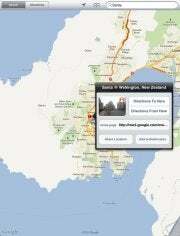 Open up Google Maps on your device and search for "Santa" to see the man in red's most recent location. If you don't have a Google Maps app on your device, point your web browser to m.google.com/maps. Android and iPhone users can also download NORAD's free official Santa tracking app from the App Store or Android Market. Both stores have many Santa-tracking apps, so make sure you get the official version called NORAD Tracks Santa by Visionbox. The app updates with Santa's current location and you can also play a game called Elf Toss where you try to help the elves load Santa's sleigh in time for Christmas Eve. One of the fastest ways to keep tabs on Santa is through NORAD's official Track Santa Twitter feed providing constant updates of Santa's location and links to the latest videos recording his journey. You can also find NORAD tracking Santa on Facebook, Google+, and Santa's latest videos for 2011 on NoradSanta.org or NORAD Tracks Santa page on YouTube. 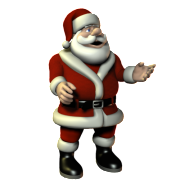 Just like last year, you can also visit SendACallFromSanta.com to send a personalized holiday greeting from Santa to any phone number in North America. And you can have the kids call Santa's Google Voice number at 1-855-34-SANTA (72682) to leave a voicemail for the man in red. Santa's sleigh, dubbed Santa One, was recently cleared to fly over American skies at an altitude of 50,000 feet. Track Santa Claus (@noradsanta) on Twitter for the latest gift news and analysis.